Clients want more. And don’t stop wanting more. Ever. Only 33.3% of corporate counsel recommend their primary law firm to a peer—a substantial drop from the 40.1% who recommended their primary law firms last year. This marks the second biggest drop in 15 years. Credit one reason—The Client Expectation Gap. Whatever you just did, no matter how great or unexpected, your client will treat this as your new minimum performance standard. Clients are not ungrateful; they want to improve their own performance and are under intense pressure to do so. You are a key part of this equation. The better your client service the better your client performs. The best client service creates time and knowledge for clients. So client expectations of you and your firm just grow and grow because your clients never have enough time or knowledge. The Client Expectation Gap appears when a firm falls short of these ever-increasing expectations. 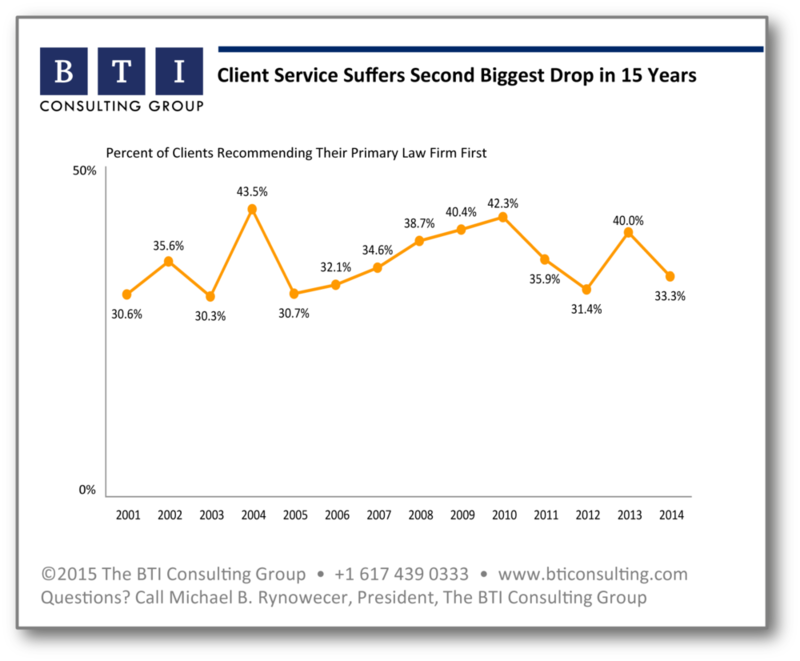 Each year the acts of client service change—gaining in value and sophistication and becoming a little harder to replicate. And every year, a group of law firms figures out how to up their game, leap frog client expectations and leave the other law firms behind. More importantly, these acts of client service differentiate these firms on a continuing basis—providing more firepower in a world where the winners will eventually take all. Next week we'll share a 5-year analysis of the law firms most recommended by corporate counsel—stay tuned.